They type of charcoal grill of your dreams depends on your needs and what grilling you plan to do. Charcoal grills come in a variety of different materials, shapes and sizes and choosing the right one should be easy once you know how much cooking surface you need. You will also want to consider how the grill can be cleaned and how durable it it. 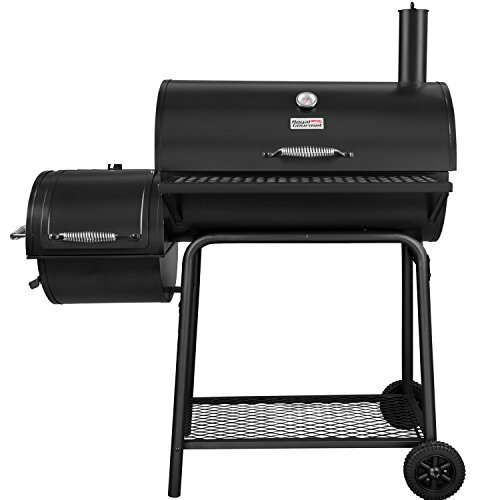 Additionally, standard charcoal grills and be very economical and there are also grill with a number of extra features that may be on the pricier side. We have brought together all of the top models and narrowed the list down of the ones we think are the best. 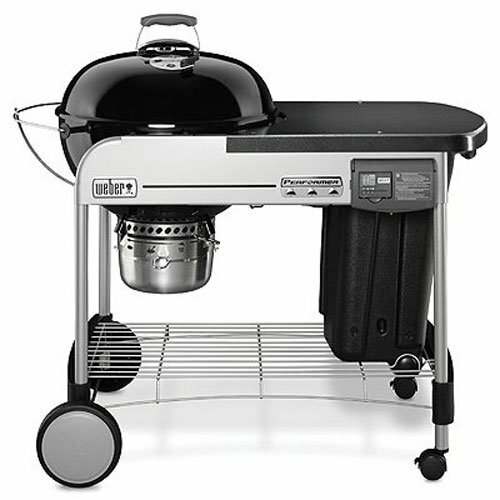 The Weber Performer PlatinumGrill features has a 22.5” diameter classic porcelain-enameled bowl and lid with a 363 sq” cooking area. There is a working surface and plenty of storage options. The Weber Perfomer also has a wired bottom shelf, a rust resistant aluminum vent and a nylon handle and it’s assembled dimensions are 40” x 50.25” x 28.5”. Specially convenient on the Weber Performer Grill is the LCD cooking timer that is removable and has an easy to read large readout which can attach to the grill. The Weber Performer One-Touch Cleaning system and removable, high capacity, aluminum ash catcher makes clean up easy and quick. The exclusive electric gas ignition system ignites the grill with the push of a button. The Weber 741001 Silver 1Touch 22.5” Kettle Grill is a sleek, legendary backyard icon available in many sizes and colors. The Weber Kettle Grill’s aluminized steel, 1Touch cleaning system makes emptying the ash easy to do in just a few moments with out dirtying your hands. 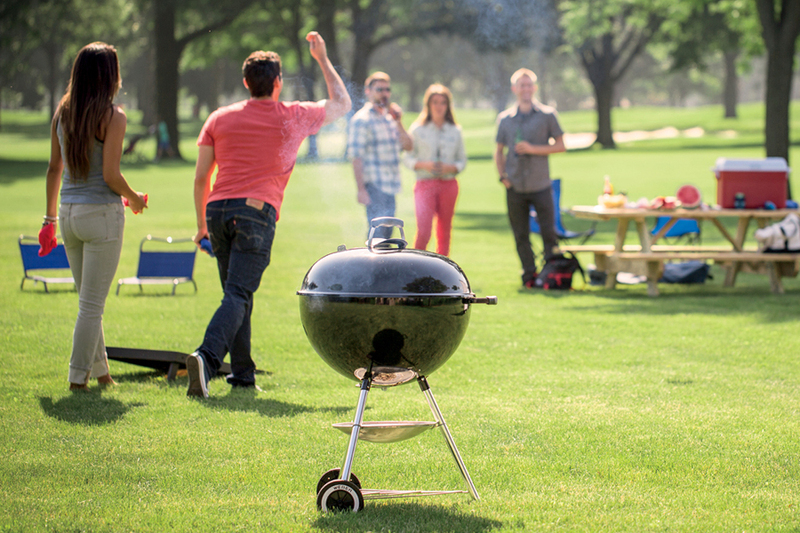 The Weber Kettle Grill will withstand the heat of many cookings and is rust and burn through resistant. The grill measures 22.5” inches long by 25” wide by 38.5” high. The heard-wearing 22.5” inch grill provides 363 sq inches of cooking area on an easy to clean, plated-steel cooking grate. The Weber Kettle Grill also features an innovative heavy-gauge steel bowl coated with porcelain-enamel and is formed exactly right to allow heat to circulated around the inside for even cooking. The Weber Kettle Grill has glass handles, rust resistant vents, durable all weather wheels & aluminum ash-catcher. The fire can be choked out easily by closing the One-Touch cleaning system and the top damper. 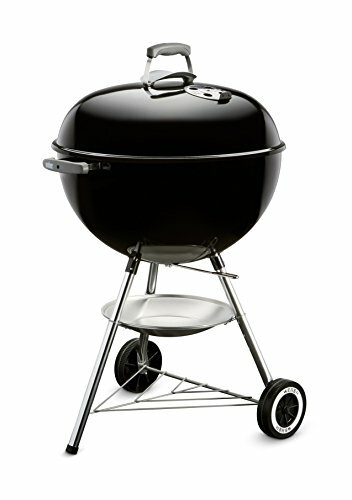 The Royal Gourmet Charcoal Grill with Offset Smoker is versatile as it can be used as a side-smoker or charcoal-grill. It is easy to assemble for standalone operation. The main cooking area is 800sq” of heavy duty cast iron manufactured grates. It is manufactured using a Heavy duty lid, with professional thermometer, big stack and cool-touch spring handle. Adjustable damper for better air flowing.Steel mesh front table and bottom shelf, provide plenty of working and storage space, very easy to clean up.. The Royal Gourmet Charcoal Grill with Offset Smoker has a convenience drawer on the side for a simple way to get to the coals and clean ashes. The Table-Top Charcoal Grill and Side FireBox is made by Royal Gourmet.